When I hear the word happy, it evokes many things inside of me. From an emotional standpoint, I think of blissful laughter, smiling, and companionship. From a physical perspective I think of health and good choices. From a spiritual perspective I think of peace and complete joy. But what does happiness mean within the confines of your marriage? I believe this question is something only you and your spouse can answer. I also think it is important that you define what happiness means to each of you before marriage and continuously during your marriage. My marriage is better today as a result of doing this very thing. 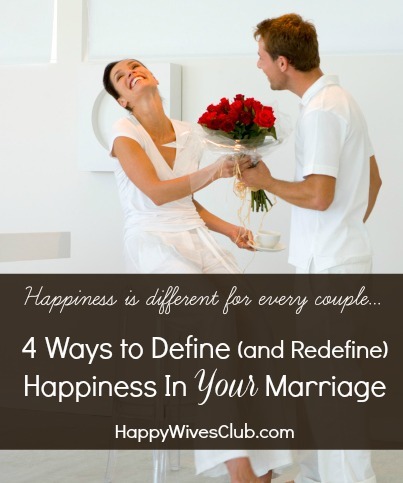 There are four things my husband and I have found that helped us to define, and at times redefine, what happiness in our marriage means. 1. Simply ask your spouse what makes them happy. It’s really that simple. You will find this conversation piece to go every which way – especially the more often you have it. It not only helps us define happiness as individuals, but allows us to define it in our marriage union. It is intense, exciting, and very rewarding. We did this during our 8-month courtship and continue to do so several times a year (this year we’ll celebrate 15 years of wedded bliss!). 2. Define your short-term marriage goals. This is another way that we determine how happiness plays a part in our marriage. We take our short-term goals and filter them through the things that make us happy. This has allowed us to reach our goals with less conflict. And let me tell you, it’s a wonderful feeling! 3. Define your long-term goals. This is very similar to #2, however there is one major variation for us. During “this” conversation, we also define what makes us unhappy. We talk about (and make a list of) things that make us unhappy (from personality traits to learned behaviors). Then we repeat this – only this time we talk about what the other spouse does that makes us unhappy. Once these things are on the table, it allows us to openly come up with a plan to conquer the things that make us unhappy and replace them with the things that do – all the while achieving our long-term marriage goals! This is process can take more than one day, but it is so well worth it. 4. Do what you can each day to make your spouse happy. Make a conscious effort to do something (or many somethings) each day that will bring happiness to your spouse. At first it used to be a bit hard for me to do this (I am a very driven type-A woman) but now I find myself in a place that it brings me absolute joy to bless my husband by doing things that make him happy! Now don’t get me wrong, I don’t want to condone unhealthy things like abuse or anything that would make you feel “less than” as a woman. I’m talking about the little things that make him tick. For my husband it can be as simple as picking up his dirty socks bundled in the corner! One key to being happy in any marriage relationship is to effectively and openly communicate with your spouse. By defining our “happy place” together, my husband and I have been able to walk out the last (nearly) 15 years in wedded bliss together. Not only am I a happy wife, but I am married to a happy husband! It takes two, so be sure to put in the work, and we’re both committed to fulfilling our vows. And if you start this process before you are married, it will greatly improve your happiness! Carlie Kercheval is a happily married work-at-home homeschooling mom of 3. Carlie and her husband co-founded Fulfilling Your Vows and together they co-author the Learning to Speak Life™ family Bible studies. When she is not busy enjoying her family and the great outdoors, you can typically find her cozied up somewhere under a blanket with a good book.